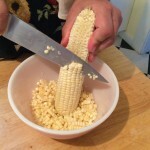 Continuing the summer corn theme, today’s recipe is corn pudding made with the extra corn and jalapeños that I bought when I was shopping for the corn chowder the other day. I made this last night as a side dish to go with grilled sirloin tip steaks and pan fried shishito peppers. I shouldn’t really call it a side dish, though, because corn pudding is always the star of the meal when we make it. Kate and I discovered corn pudding years ago at Doña Tomás in Oakland where it’s served as a regular summer specialty. It was definitely love at first bite for both of us, though we didn’t try making it at home until earlier this summer. At Doña Tomás, they make it with corn and diced zucchini, which is delicious, but, after experimenting with a number of variations, I really like the combination of corn and fire-roasted jalapeño and tend to make it that way at home. By all means, feel free to experiment with the ingredients. Last night, I crumbled a couple of strips of crispy bacon in which the vegetables, but I strongly suspect that I’ll keep coming back to the vegetarian version that I’ve written up in the recipe below. It’s just that good. This recipe makes about six side dish servings or four main course servings. Once again, you wouldn’t go wrong with a glass of cold sauvignon blanc with this, or maybe a cold bottle of Negra Modelo to celebrate the Mexican inspiration for the dish. If serving as a main course, a crisp green salad is just the thing to round out your plate. 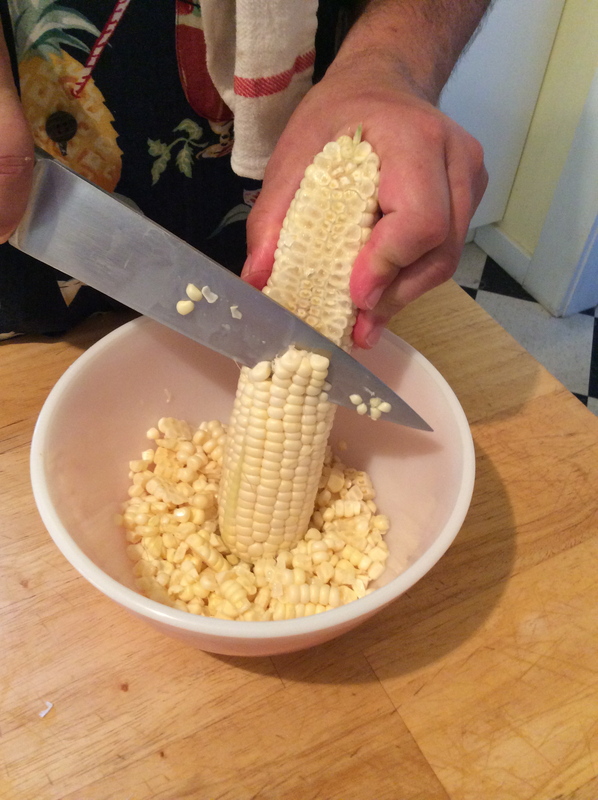 Shuck the corn, removing the silk as well as you can, and cut the kernels off of the cobs into a bowl with a knife (you should end up with approximately 1½ to 2 cups of kernels). Roast the jalapeño. 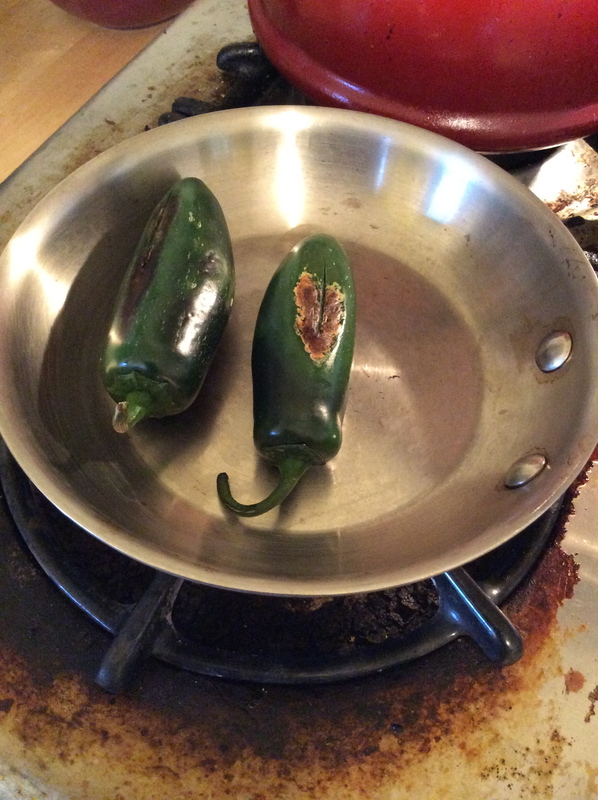 I usually just turn on one of the burners of my gas stove, hold the pepper with a pair of metal tongs and fire roast it in the gas flame until it’s blistered all over. 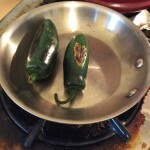 If you don’t have a gas stove, or want to be more cautious, roast the pepper in a small skillet over medium heat, turning it with tongs every so often, until it’s blistered all over. Either way, let the pepper cool a bit then peel off the blistered skin, which should come away easily. Split the pepper in half, scrape out the seeds and dice the flesh of the pepper. Add the diced roasted jalapeño and ¼ cup of all-purpose flour to the bowl with the corn and mix with a fork, or your fingers like I do, until the vegetables are evenly coated with flour. Spread the corn and jalapeño evenly in the buttered baking pan. In another bowl, or large glass measuring cup, beat the two whole eggs and additional yolk briefly then whisk in the whipping cream or half-and-half and salt until the mixture is smooth. The pudding will be richer if you use whipping cream, but it’s still delicious with half-and-half (and we usually have a quart of that in the house). Pour the cream and egg mixture over the vegetables and bake, uncovered, on the middle rack of the preheated oven for about an hour, rotating the pan 180 degrees after 30 minutes. 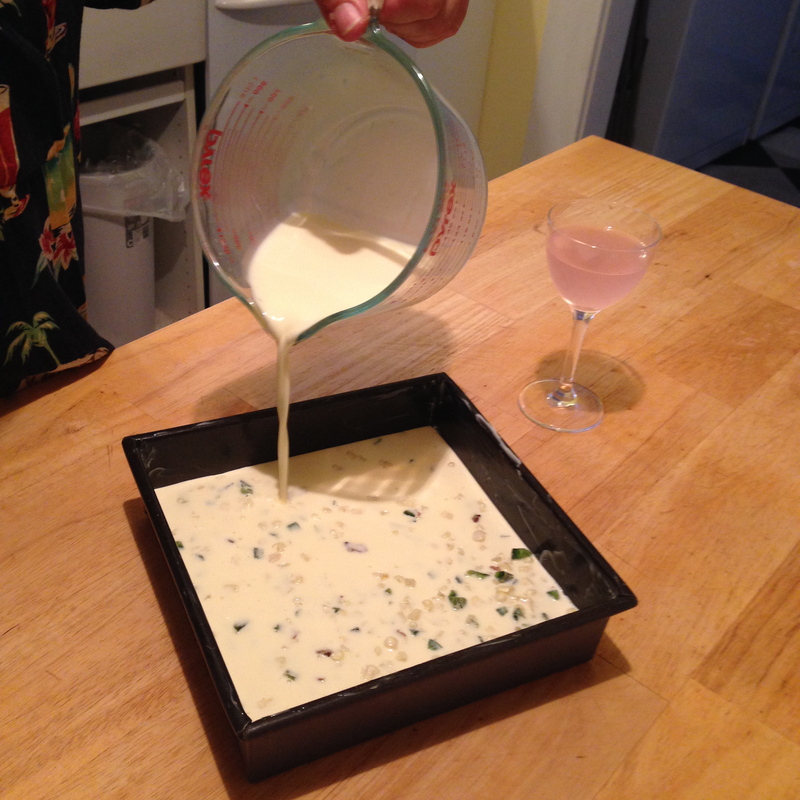 When it’s done, the pudding will be golden brown on top and slightly resilient to the touch. Let the pudding cool for about 15 minutes before serving. 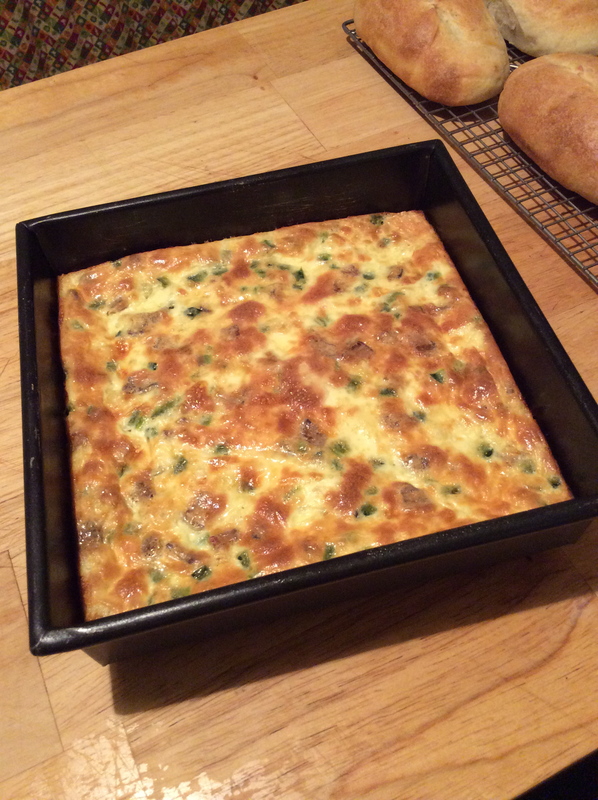 Leftover corn pudding, if there is any, is delicious either reheated or at room temperature. This recipe also doubles well for a crowd. Just use a 13x9x2 baking dish instead of the square one and double all of the ingredients, though I recommend using three whole eggs and three yolks instead of four whole eggs and two yolks and ⅓ cup of all-purpose flour is probably enough to coat the vegetables.